Lunar New Year, also known as the Spring Festival or Chinese New Year, usually falls between end of January and mid February, depending on the Lunar calendar. It’s known as the biggest and most significant celebration of the Chinese community in Singapore and pretty much the entire country shuts down. The celebration marks the start of the Chinese Calendar (which follows the phases of the moon and solar year), and while its origin is shrouded in myths and hearsay, it’s traditionally a time to honor ancestors as well as Chinese deities. Aside from being celebrated in Singapore and obviously in China, the Lunar New Year is also a major celebration in Vietnam and other South East Asian and South Asian countries. To the Western world, this would be the equivalent of New Year’s Eve and Christmas all together with meals spent together with family and friends and many quirky and interesting traditions. The festival literally paints the town red, as the colour is believed to be auspicious and bring good luck. Take a walk down the streets of Chinatown to see what I mean, red coloured paper cut-outs, trinkets and decorations line the shops. During the festival, wearing red-coloured clothing is also encouraged. 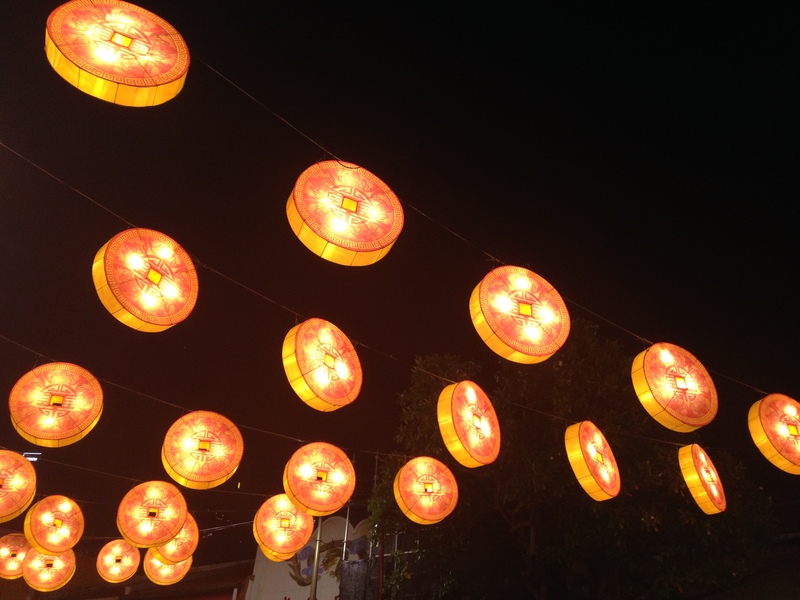 During this time, the streets of Chinatown come alive with stunning light displays and bustling night markets. 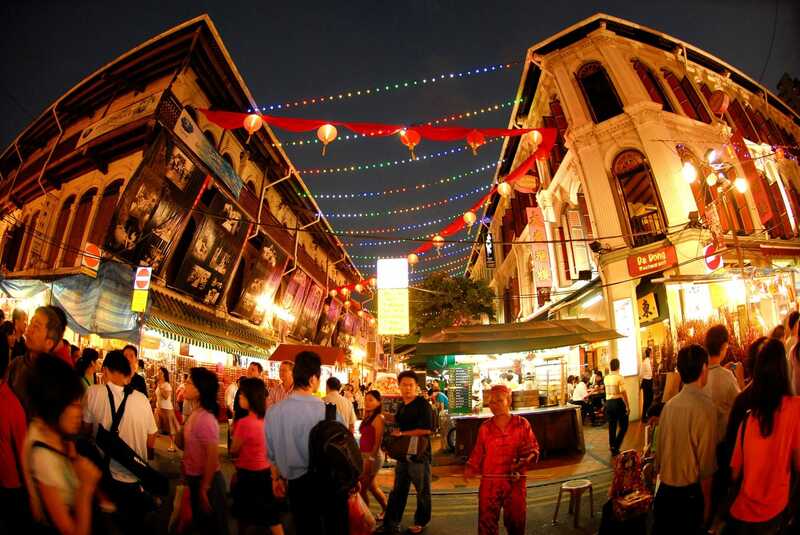 The lively atmosphere is best absorbed on a trip down to streets of New Bridge Road and Eu Tong Sen Street to enjoy the street entertainment of lion dancers and fire eaters in the days preceding the festival. It is not uncommon for families to enjoy a great spread of food and drink as they gather the evening before the start of the festival to enjoy a meal together. The typical meal for this dinner reunion in Singapore is usually a steamboat spread. Like all Singapore celebrations, Chinese New Year is also an excuse for all to take a break from the gym and snack on traditional tidbits like pineapple tarts, a pastry with pineapple filling, love letters, a flakey rolled-up biscuit, and bak kwa, sweetened roasted pork slices. During Chinese New Year in South East Asia you also get to play with your food! A traditional new year activity is to toss yu sheng, a raw fish salad also known as lo hei or lo shang. In Cantonese lo shang means “tossing up good fortune”. The tossing action is called lo hei, which means to “rise”, referring to abundance and wealth for the new year. The dish is made out of white and green radish, carrots, turnips, slices of raw fish (commonly salmon), crackers and topped with a dressing of plum sauce, five spice powder and sesame oil. Families and friends gather together to toss the dish, saying auspicious well wishes out loud to usher in good luck. The higher you toss, the greater your fortune will be. It usually creates a big mess, but it’s well worth it for the prospect of good fortune and good fun. Over the course of the festival, families usually take the time to honour one’s elders and families by visiting the oldest and most senior members of their extended families first, usually their parents, grandparents and great-grandparents. Traditionally most people would put on new clothes during these visits to mark a fresh beginning for the new lunar year. The usual greeting would be to present the owner of the home or the host of the party with two oranges in hand. The oranges symbolise wealth because it sounds like the word for “fortune” and “luck” in the a certain Chinese dialect. The oranges are exchanged with the host’s own and given to the visitors before they leave, symbolising the exchanging and spreading of luck and wealth. Small orange trees and oranges are found across the city. You are likely to see the little trees, filled with plump oranges, lining the main roads and standing by the entrance of shops and businesses. They are decorated just like we would decorate Christmas trees, with red ribbons and sometimes with lights. Younger children in particular love this festival because as part of custom they will receive red paper packets filled with money from parents and other adults who are married during visitations. It is custom and polite for children to wish elders a happy new year and a year of happiness, health and good fortune before accepting the red packet. The red envelops are also the way to exchange gifts among the locals and some companies will even give them to their employees. Loud music and the clashing of symbols is not uncommon during the Lunar New Year, when the lion dancers come out to play. Dressed is bright and attractive colours, two dancers will usually role play under the guise of a lion to entertain the crowd. One will usually act as the head, and the other the body, and as the dancers perform a series of acrobatic leaps and tumbles, the ‘lion’ will dance and play, interacting with the crowd. The traditional dance is thought to bring good luck to those around, and is usually extremely entertaining to watch. One thing about Lunar New Year in Singapore that makes the festival unique compared to other nations that celebrate the Asian holiday, is that Singapore is multi-racial and ethnically diverse. It’s not uncommon to see people of other races, religions and ethnic groups dressed up in Chinese ethnic costumes, following the traditional Lunar New Year practices of visiting the homes of relatives and friends with two oranges in hand and joining in the feast and festivities. So regardless of your ethnicity or origin, get dressed up and join in the celebrations!